Author Name: Demana, Franklin D.
MULTIPLE COPIES AVAILABLE! PLEASE NOTE: WE PREP OUR BOOKS WITH PROFESSIONAL GRADE REPAIR TAPE, HOT GLUE TO HOLD EVERYTHING TOGETHER, AND NEW NAME PLATES!! OUR COMPETITORS DO NOT DO THIS!!! 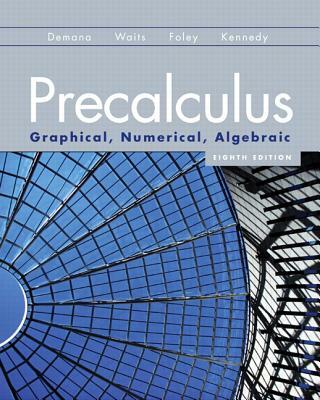 Prentice Hall: Precalculus - Graphical, Numerical, Algebraic, Student 8th Edition [Hardcover]. Copyright-2010, ISBN:0131369067. These books are in ACCEPTABLE condition with the interior pages and bindings intact, and with CONSIDERABLE wear to the exterior covers! These books contain STAINING, WRINKLING, and/or WRITING to the interior pages. This DOES NOT affect the functionality of these books as they are still quite serviceable! We ship daily, Mon-Sat. Customer service is always our top priority!